Pneumatic fenders, as a kind of marine fender, also be called as YOKOHAMA rubber fender for the tire and chain net, is a keen anti-collision device for marine application. It serves as a protective medium against collision when ship-to-ship contact (STS) application and ship-to-berthing (STB) application. Pneumatic fenders have the advantages of massive energy absorption with low unit surface pressure acted upon the ship as an ideal ship protection medium used extensively by large tankers, LPG vessels, ocean platforms, large docks, harbor and wharves etc. As stand-off fenders to realign ships with shore facilities. We supply the Pneumatic Rubber Fender with dimension from Dia.0.5mxL1mto Dia.3.3mx L6.5m. The Fenders strictly follows ISO9001: 2000 quality control system and ISO 17357, and its main products have obtained quality authorization of China Classification Societies. Looking for ideal Rubber Dock Fender Manufacturer & supplier ? We have a wide selection at great prices to help you get creative. All the Commercial Dock Bumpers are quality guaranteed. 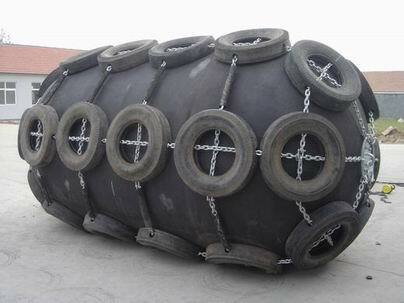 We are China Origin Factory of Floating Pneumatic Rubber Fenders. If you have any question, please feel free to contact us.